Now the first month into legal California cannabis, seven months into Nevada recreational or years after Washington and Colorado- it's time to stop hiding! Time to start acknowledging cannabis as apart of our every day lives. It's never been easier to find bongs, pipes and one hitters in all kinds of stores and online. One could say the pipe hasn't evolved in many years but there are still artisans pushing the extremes of the functional art and it's more accessible than ever. There are lots of recommendations about what to smoke, where to buy it, how it should be, how you should be smoking. 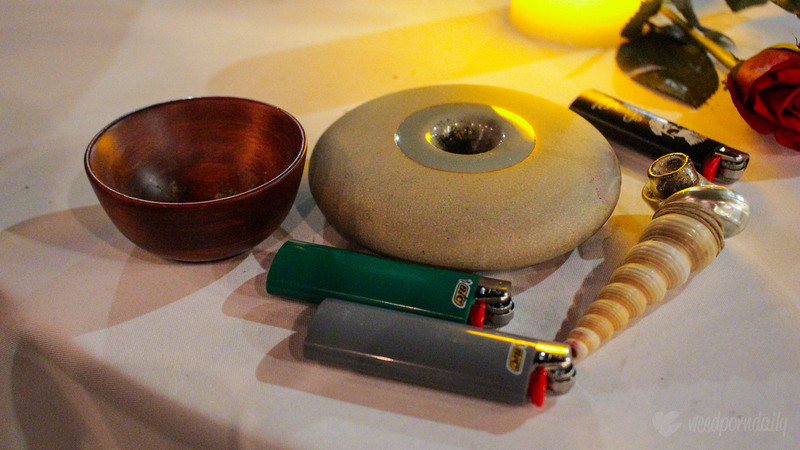 The ritualistic act of consuming and enjoying cannabis medicinally has been evolving past a quick hit and a rush. The cannabis experience is becoming not something you hide but something you share and want to share with others. You can read about how we introduce our guest to cannabis here. The cannabis industry faces a large issue with it's fight between commercialization and artisan crafted products. 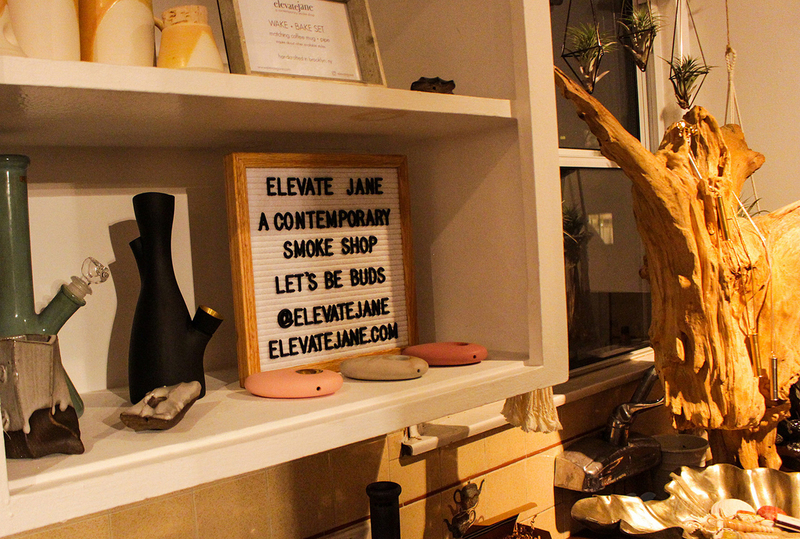 In the struggle for the balance between fine products and accessibility Elevate Jane finds it's comfortable niche serving those interested in presenting their consumption & medication as another aspect of their life- deserving of a showcase through pipes, bongs and vaporizers. 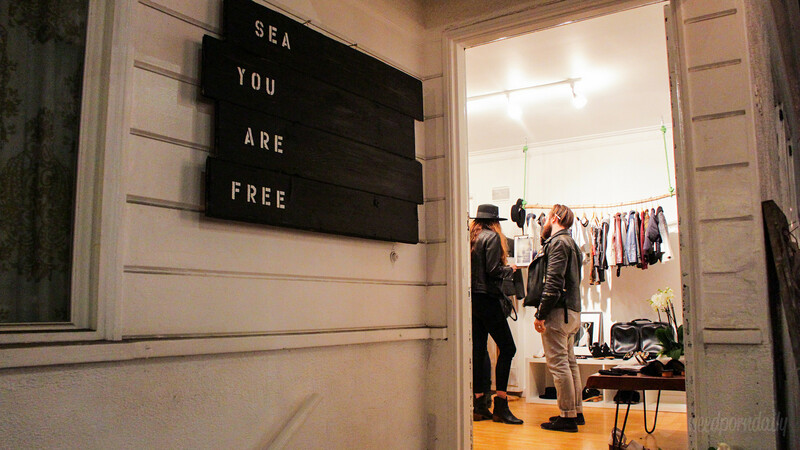 We met with Angela Mou, founder, last December at her boutique opening at See You Are Free (S.U.R.F), a fashion & lifestyle collective showroom. Located in Venice Beach, S.U.R.F. is right on Abbott Kinney- one of the iconic landmarks on the Los Angeles county coast. 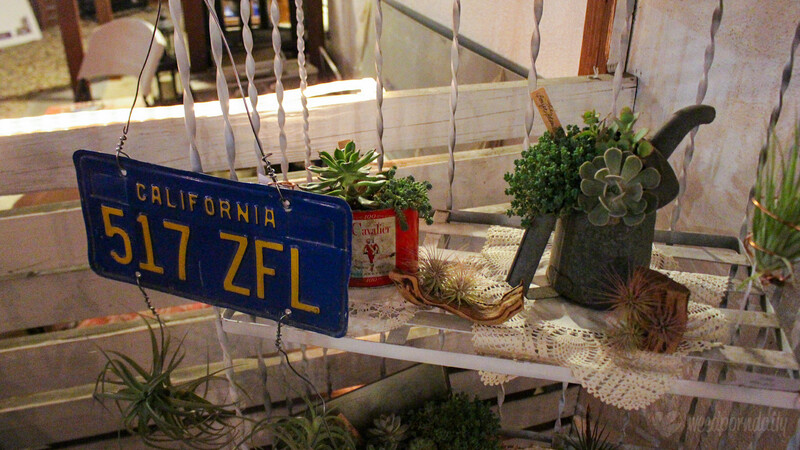 Deemed one of the coolest blocks in America, the street of Abbot Kinney is like the Rodeo drive of the eclectic & hip. 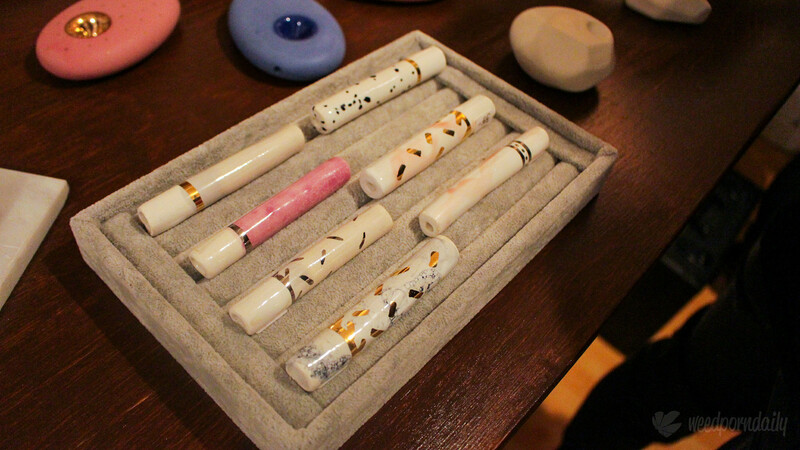 Nestled amongst the different fashion lines a wide variety of artisan crafted pipes, chillums and bongs were stocked alongside jewelry and ceramics on display. This wasn't an add-on "cannabis section" to the collective. 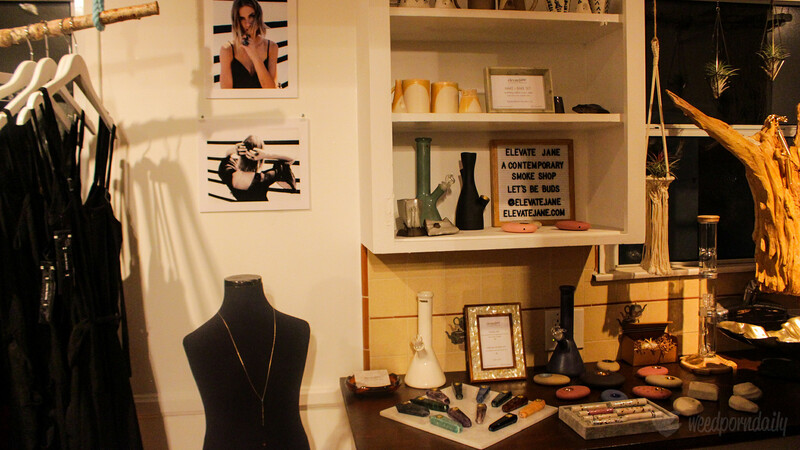 The Elevate Jane space was a curated collection of artist and designers showcasing unique pieces. At the beginning of the selection were necklaces on display by Inda. Designed and hand assembled in Vermont, the pipe necklaces merge elegance with a subtle nod to your favorite after work pass time. Easily have it with you anywhere preloaded with your preferred cannabis. If metal wasn't your style the variation in the natural beauty of crystal and ceramics were available as pipes. Small and stylish for on the go and visiting friends for a session. 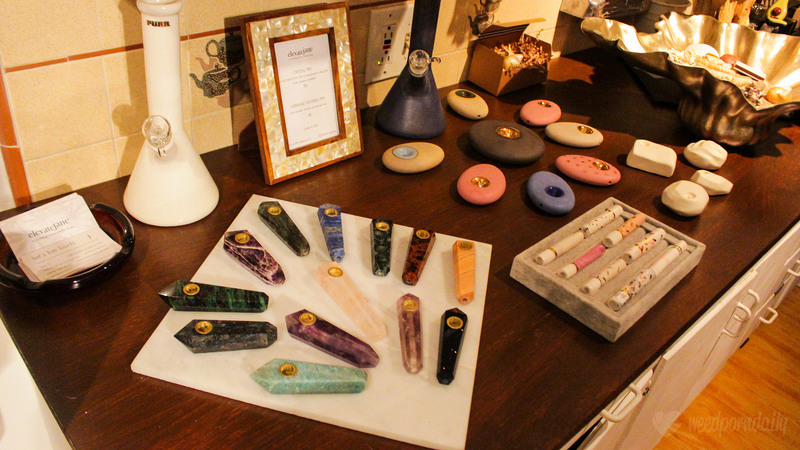 Many of the products on display were one of a kind pieces, many hand crafted. 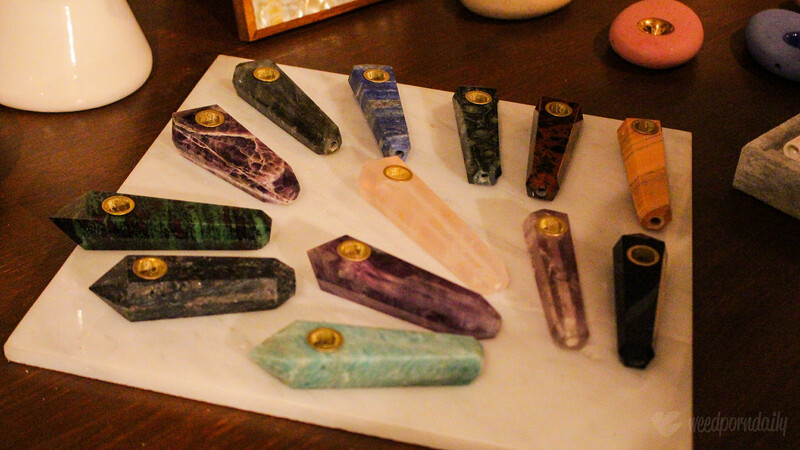 The products such as the crystal pipes all unique in their natural patterns even with the same stones types. Matching the beachy vibe running through the exterior and interior of the store- on display in a silver shell were the appropriately named "mermaid" pipes. 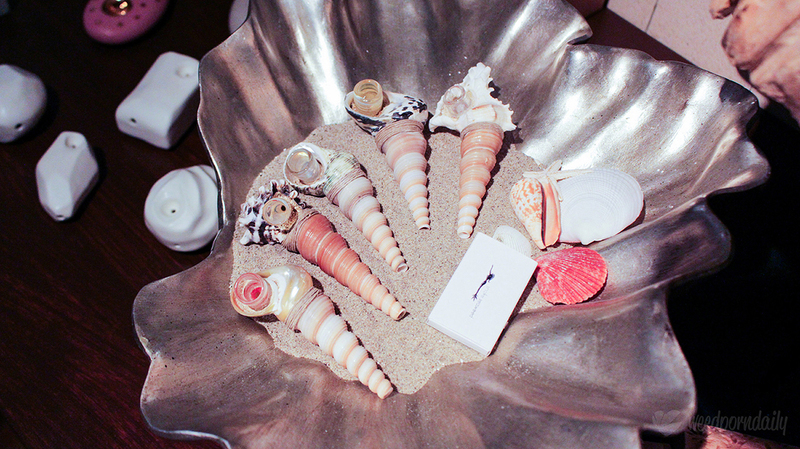 Crafted from two shells paired with hand blown glass naturally bound with ceramic & sand. Similar to the Miwak Junior pipe, the unique shape and length of the seashell pipe allowed for interested air to smoke ratio enhancing the inhalation. Another specialty pipe on showcase that night were two new ceramic pipe designs by Miwak Junior in both the Dark brown Stoneware with a hand painted 22k Golden and a soft pale blue glaze bowl varieties- the circular pipe created an incredible airflow experience, enhancing the taste of the samples available. An exclusive product that evening. Pairing artisans with the all natural cannabis market really inspired unique pieces that would be an excellent display for the coffee table and ice breaker at your next gathering. 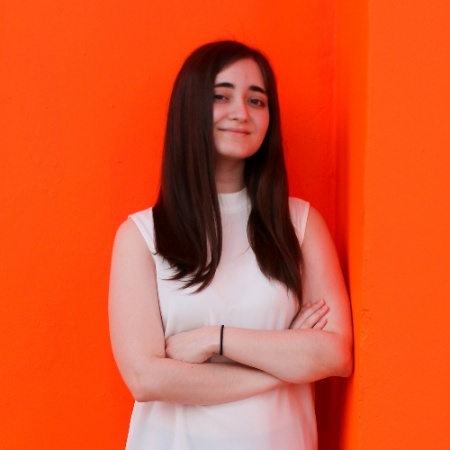 These pieces are both simple and exciting to try. Many of these pieces are one of a kind and can be ordered exclusively through Elevate Jane but also available at their collective showroom in Abbot Kinney, Venice Beach and events in the Los Angeles area (such as our recent Constellations event in Long Beach).